In case you hadn’t heard, Lionel Messi and Luis Suarez are both pretty good at soccer. Records are set and those guys break them, because that’s just what they do. That’s an inch-perfect ball from Suarez to Messi, who makes the finish look easier than it is. It took them only three minutes to score against Leganes, who sit way down in 17th place, compared to Barcelona’s third. 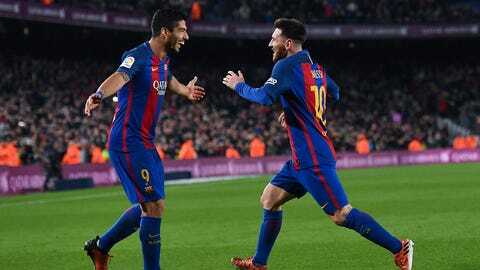 With that goal, Suarez has now recorded 38 assists since he joined Barcelona in the 2014/15 season, outpacing everyone else in that time. He’s been on fire since arriving at Barcelona and no one has been better at creating goals. This season alone, he has been part of more goals than any other player in Europe’s top five leagues at 26 — 18 goals, 8 assists. You heard it here first: Messi and Suarez = good at soccer. Gallery: Which country made the most money on transfers last year?